The Ubiquitous Computing paradigm describes a world in which electronic devices are not only unobtrusively embedded within the human’s environment but also in which electronic devices are interacting with each other to support humans in their daily life. Hence, Ubiquitous Computing deals with a wide range of research topics related to Pervasive Computing, Wearable Computing, Ambient Intelligence, Intelligent Environments, Automotive Computing and Smart Homes. Thereby, the context- and location-awareness of Ubiquitous Computing systems are the key enablers for many application scenarios such as carsharing, navigation systems, location-based marketing, home automation or context-aware services in general. The Ubiquitous Computing field is highly dependent on the underlying wireless communication technologies such as 5G networks, WLAN, Bluetooth, NFC etc., and many research questions deal with the optimization of protocols and algorithms that are applied over these wireless communication networks. Our research related to Ubiquitous Computing focuses on developing context-aware middlewares for smart mobile devices like smartphones, wearables or tablets. Our work encompasses the design and development of proactive context or location-based service infrastructures for indoor and outdoor environments as well the investigation of new methods for the datafication of mobile data. 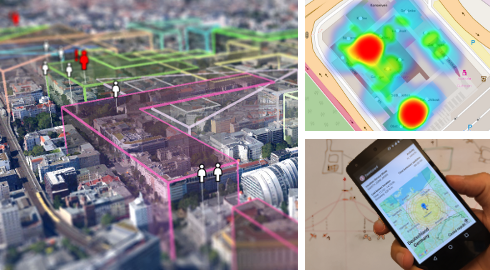 By enhancing context-aware systems with latest spatiotemporal data analytics techniques, we envision intelligent environments which are able to autonomically learn typical behavior patterns and adapt mobile applications according to situational needs. These self-adaptive systems come along with several interesting research challenges like automatic data processing and analysis, energy-efficient context-awareness and profile-based adaptation of mobile devices, which are all addressed within our research group. Plass, J. and Zickau, S. (2019). Wie Ortungstechnologien den Datenschutz im Anti-Doping verbessern können. Anti-Doping. Kritik und konstruktive Auseinandersetzung. Marcel Scharf und Nils Zurawski. Beierle, F. and Tran, V.T. and Allemand, M. and Neff, P. and Schlee, W. and Probst, T. and Pryss, R. and Zimmermann, J. (2018). TYDR - Track Your Daily Routine. Android App for Tracking Smartphone Sensor and Usage Data. 2018 ACM/IEEE 5th International Conference on Mobile Software Engineering and Systems (MOBILESoft '18). ACM, 72-75. Rodriguez Garzon, S. and Walther, S. and Pang, S. and Deva, B. and Küpper, A. (2018). Urban Air Pollution Alert Service for Smart Cities. Proceedings of the 8th International Conference on the Internet of Things (IoT 2018). ACM. Beierle, F. and Tran, V.T. and Allemand, M. and Neff, P. and Schlee, W. and Probst, T. and Pryss, R. and Zimmermann, J. (2018). Context Data Categories and Privacy Model for Mobile Data Collection Apps. Procedia Computer Science, 18-25. Beierle, F. (2018). Do You Like What I Like? Similarity Estimation in Proximity-based Mobile Social Networks. Proceedings 2018 IEEE International Conference On Trust, Security And Privacy In Computing And Communications (TrustCom). IEEE, 1040-1047. Herber, T. and Jentsch, M. and Zickau, S. (2017). Datenschutz und Dopingkontrollen. Datenschutz und Datensicherheit - DuD, 427-433. Rodriguez Garzon, S. and Arbuzin, D. and Küpper, A. (2017). Geofence Index: A Performance Estimator for the Reliability of Proactive Location-based Services. Proceedings of the 18th IEEE International Conference on Mobile Data Management (IEEE MDM 2017). IEEE. Beierle, F. and Grunert, K. and Göndör, S. and Schlüter, V. (2017). Towards Psychometrics-based Friend Recommendations in Social Networking Services. 2017 IEEE 6th International Conference on AI & Mobile Services (AIMS 2017). IEEE, 105–108. Deva, B. and Raschke, P and Rodriguez Garzon, S. and Küpper, A. (2017). STEAM: A Platform for Scalable Spatiotemporal Analytics. 8th International Conference on Ambient Systems, Networks and Technologies, ANT 2017, 731-736. Zickau, S. (2016). privGardens - Semantic Privacy Areas in Location-based Data Protection Policies. 13. GI/KuVS-Fachgespräch "Ortsbezogene Anwendungen und Dienste". Logos Verlag Berlin GmbH. Beierle, F. and Grunert, K. and Göndör, S. and Küpper, A. (2016). Privacy-aware Social Music Playlist Generation. Proceedings of the IEEE International Conference on Communications (ICC 2016). IEEE, 5650-5656. Deva, B. and Rodriguez Garzon, S. and Küpper A. (2016). FlashPoll: A Context-aware Polling Ecosystem for Mobile Participation. Proceedings of the 19th International Conference Innovation in Clouds, Internet and Networks (ICIN 2016). IFIP, 169-176.